Home » attraction » Bali » What Are The Things to Do Near Banjar Hot Spring? Find The Spectacular Ones Here! In Bali island, it’s not a new thing that you can find so many beautiful beaches, like one of them in things to do in Pandawa beach Bali Indonesia. Those beaches are great, and so calming. But in the other hand, visiting the same spots again and again would be pretty boring. The first location we want to introduce to you is of course the hot spring itself called Banjar Hot Spring. 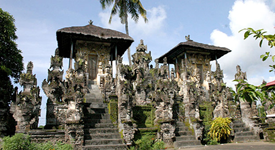 The place is already famous because it has this unique looking that very Balinese and showing the art of Balinese culture. The other thing beside things to do in Lake Batur Bali to find in this island that located around The Banjar Hot Spring is Sekumpul Waterfall. The name Sekumpul came from the word “Kumpul” which means gathering. The reason behing the naming is, because there’s not only one waterfall in here, but some. There are two waterfalls in total that “gathering” in this place. Both of them have the same height of hundred meters. When rainy season comes, one waterfall has different colour than the other. Administration ticket is needed for entering the place. You can pay for about Rp15.000,- plus Rp10.000,- for it. Tips : It can be a slippery in there, always be careful of your step. In Bali, you can find so many temples. There are some noticable temples in here that always becoming a perfect tourism object for the tourists and a very majestic spiritual places for Hindu people. One example of them, which is also located around the area of Banjar Hot Spring is Dalem Jagaraga Temple. It’s included inside the environment of Kahyangan Tiga Jagaraga which basically have the same specifications as the Dalem temples. Basically it’s free to enter a temple in Bali, but you still need to pay the parking ticket though. The other spot you can find around the island of Bali beside hidden places to stay in Bali is Yeh Sanih Pool. This pool is natue made one that located around 17 km from the city of Singaraja. There are two pools in here, one for adults and the other for kids. Yeh Sanih is really suitable for family vacation, because beside it’s very natural, it’s also a very affordable yet wonderful attraction to visit. There are also some facilities that very supporting the tourists there like some hotel and restaurant. Administration fee is Rp10.000,-. Vacationing in Bali is very tiring. It’s fun too of course, but at some points within a day, the body condition can reach its lowest level. There are some ways to restore it, like visiting salon and spa. And there’s one located near Banjar hot spring like Kirani Salon and Spa. The place is really suitable for the tiring tourists who already have very tight schedule and activities that make them need a refreshment. The facilities, the services are pretty complete and surely will be loved by women. Tips : Prepare your budget first before visiting it. High quality services come with high price. 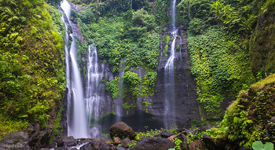 In the area of Buleleng, there are some famous waterfalls that always visited by tourists. 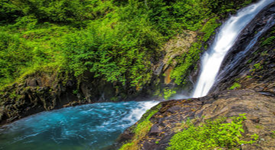 One example we want to introduce is Aling-aling Waterfall. The venus is still natural and can be said as virgin because the condition is still very green. It has 35 meters high and around it, there’s a cliff where people, who love a challenge, will jump into the water below from top of the cliff. It’s satisfying actually, but in some way, it’s also really dangerous. But, it’s still a very good waterfall that you can visit around Banjar Hot Spring. There’s one beautiful waterfall, beside the things to do in Abang Bali named Gitgit Waterfall. This waterfall is often called as a twin waterfall. It has two streams of water, just like the other waterfall we already talked about on paragraph above. Tips : In the place that considered to be a sacred one, don’t forget to always respect the culture there. 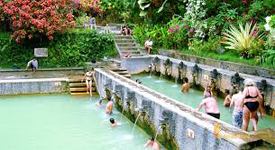 That’s all for today with the list of things to do near Banjar Hot Springs Bali. The place is very useful for the people who are really tired and stress, and looking for a simple and yet a beautiful place. Beside, the place is very reachable. So, the area around the hot spring are also very relaxing. 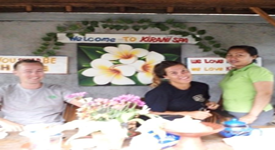 Things like Kirani Salon and Spa and some examples of majestic waterfalls there like Aling-aling waterfall and Gitgit waterfall are also eye catching. Don’t forget to visit while you have a chance!